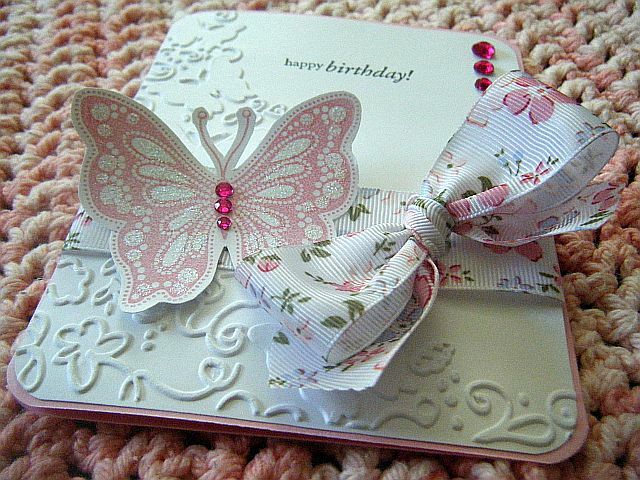 Another pretty Birthday card I made for my stash. I was getting quite low on cards so I made three of these. 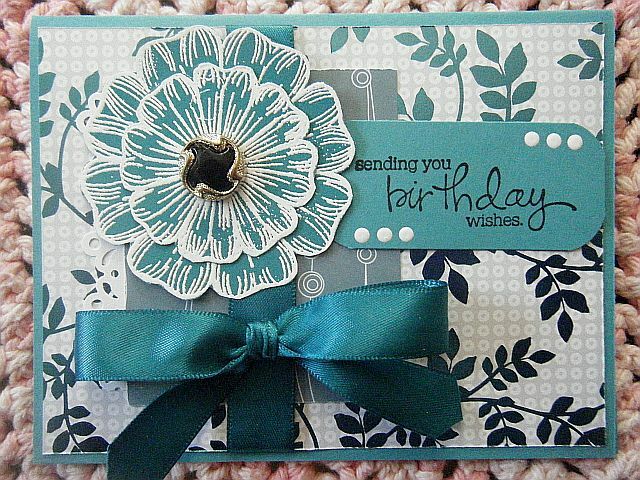 I love this flower stamp from Heartfelt Creations. I heat embossed it with bright white. My Friend Jamie is having her first baby and I am so happy for her! I was so pleased when her co-workers asked if I would make a card for the shower for everyone to sign. I made this card a couple of weeks ago but couldn’t post it as I was certain she would see it because I know she visits my blog often. 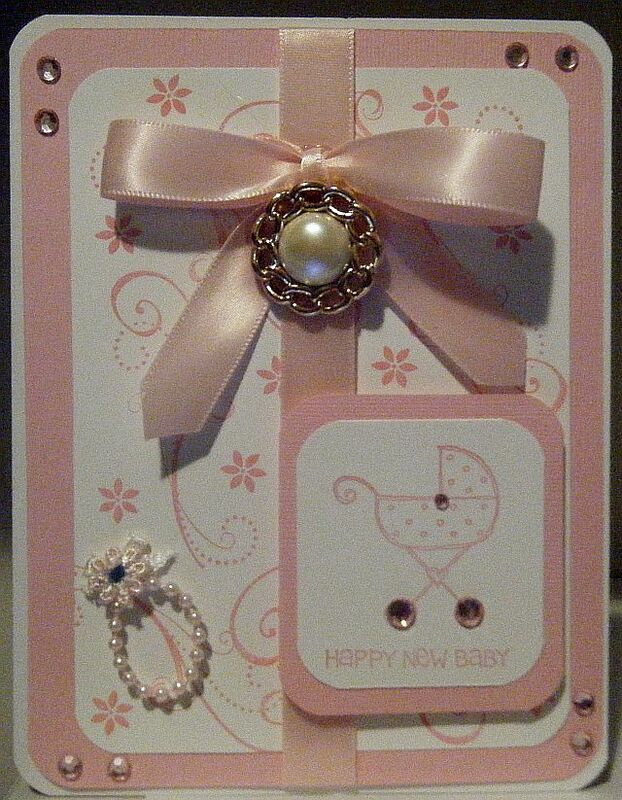 This is the first Baby card I have made. I didn’t have any appropriate paper for babies so I improvised and made my own. 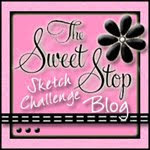 The background is just plain white card stock that I stamped with the swirls and flower stamp from the Stampin’ Up! Season of Joy set. I made this card a little larger than I usually do so that there would be room for everyone to sign it. Pink Pink Pink! Guess you can guess that she’s having a girl 🙂 All the stamps I used are from Stampin’ Up! and I added some bling and the pretty pink ribbon. Not bad for my first go at a baby card. Enjoy this special time Jamie and keep in touch! I am really going to miss you at work! 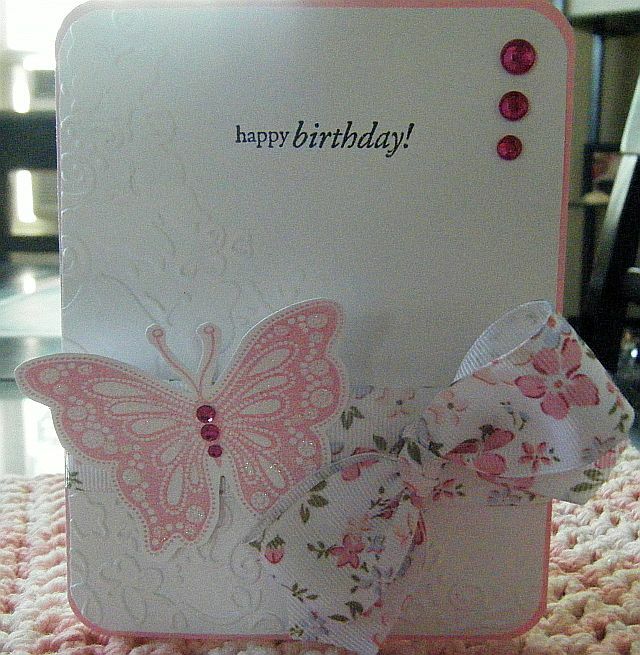 Thanks for all the kind words and support with my card making obsession. I hope you are enjoying your day as much as I am!